Mycotoxins are toxic compounds that are naturally produced by certain mold and are regularly found in foods. The consumption of food products contaminated with mycotoxins can cause acute or chronic toxicity in human health. Because of the thermal stability during food processing, the sensitive and reliable methods for their detection are required. FUJIFILM Wako offers a wide range of standards and reference materials for the qualitative and quantitative analysis of mycotoxins. 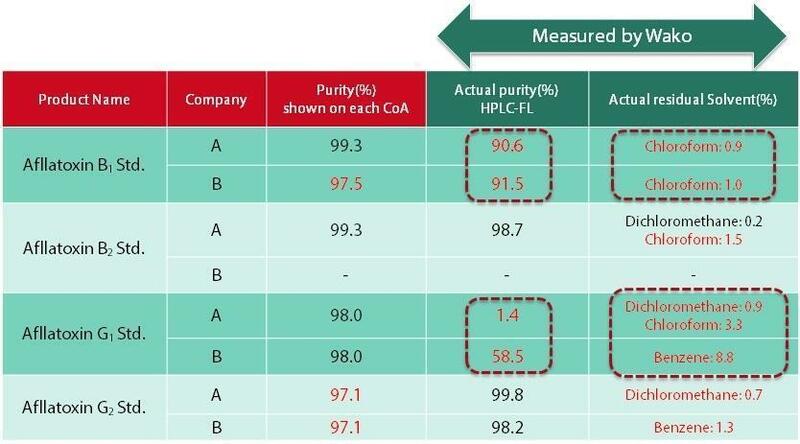 We found that the above mentioned products contain several impurities and residual solvents after measuring by HPLC-FL. Since aflatoxin B1 and G1 have weak fluorescence intensities, it is difficult to assure each quality only by HPLC-UV and LC-MS/MS. We think that those assays by HPLC-UV and LC-MS/MS are not enough for quality control for aflatoxin B1 and G1.